Dismantling Equips is the best way to get free Runes in the game. Runes are used for crafting VS, VVS, or VVS equipment for your character. If you want to get stronger, these Runes will get you started! To start disassembling items, talk to the Rune Artificer located below the West Guards in Lan Forta. Runes can be randomly obtained depending on the item level and grade. Is Lady Luck on your side? - Only Grade 2 (green) or above Equipment can be disassembled into Runes. - All equipment can be dismantled except Helmets, refer below. - Disassemble items that you don't need to get Runes for Crafting! - If you want to craft a specific item, farm items that will give the Runes you need. 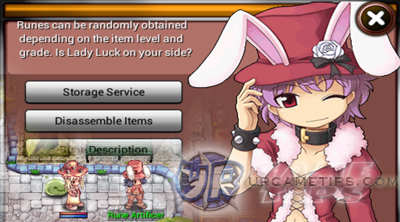 - You can also buy cheap items at the Auction Machine to get more Runes. - Sell unwanted Runes at the Auction Machine to gain more Zeny. refer to the sample Item Extraction Rate below. - So higher Grade/Rank and Lvl items yields better Rune Grades. crafting and dismantling a Lvl 20 to 29 VS items. You can also buy them cheap at the "Auction Machine" because some players are still unaware of this. - Grade 2 Lvl 70 and above (green) items = Grade 3 Sup. Runes! - Grade 3 Lvl 50 to 69 (yellow) items = Grade 3 Sup. Runes! 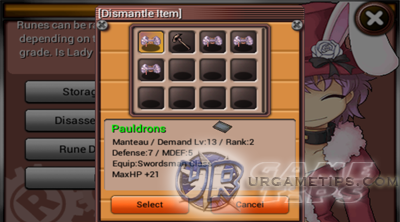 - Grade 4 Lvl 40 to 59 (purple) items = Grade 3 Sup. Runes! - Grade 3 Lvl 70 and above (yellow) items = Grade 4 Ancient Runes! - Grade 4 Lvl 60 and above (purple) items = Grade 4 Ancient Runes! - Just concentrate on leveling up until around Lvl 30 before you start farming. - Refer below for sample monsters that drops Grade 2 green items or higher. - Chon Chon: Pauldrons; Cloack of Survival; Beach Mant. - (VS) Thorn Muka: Old Mant. - Joining a party will increase drop rates, the more, the better! - VS or higher monsters will drop better item grades with better drop rates.